Lloyd Rees was an Australian landscape painter who twice won the Wynne Prize for his landscape paintings. Lloyd Frederic Rees AC CMG (17 March 1895 – 2 December 1988) was an Australian landscape painter who twice won the Wynne Prize for his landscape paintings. Most of Rees’s works are preoccupied with depicting the effects of light and emphasis is placed on the harmony between man and nature. Rees’s oeuvre is dominated by sketches and paintings, in which the most frequent subject is the built environment in the landscape. Lloyd Rees was one of Australia’s most widely respected landscape painters. He commenced his art studies in his native Brisbane before coming to Sydney in 1917 to work in the advertising firm of Smith and Julius where he met a number of other artists. 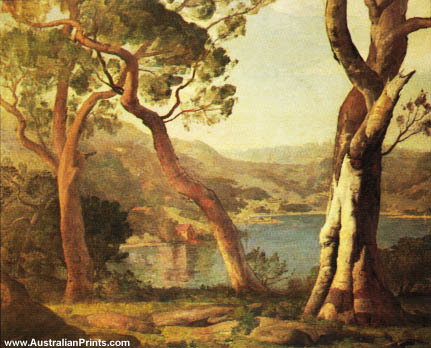 His Australian landscapes, while based on acute observation and deep affection, have always shown the influence of European traditions, particularly those of Italy and France. In 1923 Rees left for the first of four trips to Europe. It was after this that his palette became stronger. However, atmosphere was always combined with solidity and structure until failing eyesight made this increasingly difficult. Water, particularly Sydney Harbour and the Lane Cove River, has been a consistently favourite subject. Artist information page for Lloyd Rees. This article uses material from the Wikipedia article Lloyd Rees, which is released under the Creative Commons Attribution-Share-Alike License 3.0.